Clay is a cheap and versatile material which can be used for both thrown and hand built work. There are different types of clay from studio stoneware, red, black and white earthenware to white porcelain each having properties suitable for different types of work. There are lots of different ways of working with the clay including the use of oxides, scraffito, modelling to names but a few. Thrown pottery - wheel thrown pottery requires patience, skill and practice. You cannot expect to throw a perfect tea set before you have learnt the basics and even then it takes lots of practice. In time vases, bowls, jugs, teapots and cups can be produced. Hand built pottery - hand building with clay is very rewarding and can be challenging. Different shapes, textures, sizes and forms can be made with a few basic rules. However, as with most pottery you can never really predict how things will turn out so be prepared to be surprised. For larger work using an earthenware body with crank is best as it keeps its shape well. 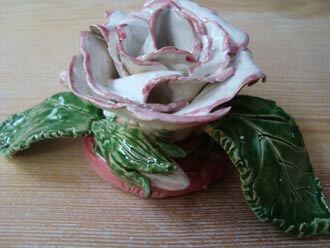 For more delicate ware using a porcelain allows you to work in fine detail but both techniques have there own problems. Guidance will be given with all techniques - slab, coil, modelling, moulding and decorating. There are paint on glazes which fire at 1000c the same temperature as bisq firing and earthenware glazes firing at1140c and stoneware glazes firing at 1260c. A full range of colours offered. Pottery in all its forms is suitable for all beginners and the more experienced. As with all workshops please ring or email to book time in the workshop. Click on the link to see the cost of a session.